Boils are hard, red, painful, and rather deep-seated swellings, usually beginning as pimples or nodules about hair roots. They increase rapidly in size and develop "cores" in their centers. Furuncle is another name for a boil. Boils themselves are not contagious, but rather the microscopic organisms that bring about boils are. Until it depletes and mends, a fluid filled boil is infectious. The disease can spread to different parts of the individual's body or to other individuals through skin to skin contact or the sharing of personal things. Carbuncles are unusually severe forms of boils, ordinarily characterized by more than one core or head, and accompanied by considerable systemic disturbance and general illness and debility. 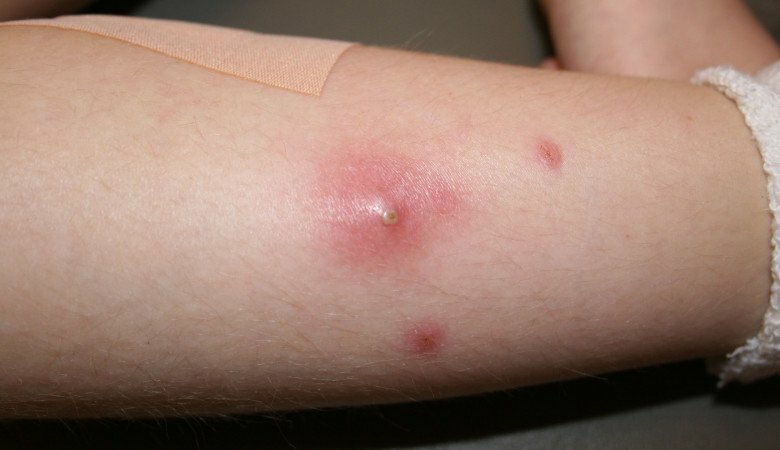 Boils and carbuncles are caused by the same kind of germ a more or less virulent strain of Staphylococcus aureus as a rule. To start a boil or carbuncle, the germs must gain entrance to an oil or sweat gland or to a hair follicle. It has often been noticed, however, that a general low level of resistance, a low metabolic rate, rubbing in of dirt by clothing, or the presence of diabetes mellitus paves the way for the development of boils or carbuncles-facts which emphasize the need for a physician to study cases characterized by a "run of boils." through a break in the skin. The pus, containing living germs, may spread the infection and cause other boils if it comes in contact with unprotected skin. Warmth and moisture hasten the formation and breakdown of the core, and help to keep the skin soft so that the pus may more easily break through. If the skin is kept wet continually, however, it may become soft enough to encourage the spread of germs through it. Dressings wet with strong solutions of salt or other suit able chemicals tend to stimulate the drainage of the pus out of the tissues and into the dressings. Boils are most painful if located on a skin area with but little soft tissue between the skin and the underlying bone. They continue to be painful until free drainage of pus is established. Following adequate drainage, a boil subsides quickly. The danger of squeezing or picking at boils needs to be emphasized. The collection of germs in the forming core may be broken up and spread into surrounding tissues, thus making the boil larger than it would otherwise be. The germs may even spread into the bloodstream, causing septicemia or "blood poisoning," which may prove fatal. The most dangerous spot in all the body for a boil to be located is the area marked out by the bridge of the nose, the corners of the mouth, and the outer comers of the eyes. This includes the inside of the nostrils. Many cases of fatal septicemia or meningitis have resulted from improper interference with boils or pimples in this area. 1. Immediately upon the appearance of a pimple which appears severe enough to develop into a boil if it is not deep-seated and has a small yellow spot in the center-dip the point of a needle into tincture of iodine or carbolic acid and open the pimple by thrusting the needle sideways. 2. Apply salicylic acid cream after cleansing of boil with iodine solution. Salicylic acid has bacteriostatic effect and reduces the chances of staphylococcal infection which common infection of skin. 3. Apply some soothing agent like glycerine to avoid irritation and pain due to swelling process.